We are excited to welcome back one of our popular African single origin espresso from earlier this year – Bokasso. For those who had tried this coffee a few months back, we present the new crop of Bokasso from this year’s harvest. This coffee from Sidama is a gem with lovely floral aromatics and layers of flavours that tantalise your palate as you sip the espresso. The Bokasso Cooperative belongs to the Sidamo Coffee Growers Cooperative Union which is the umbrella organization for all the Sidamo cooperatives and is the one that ensures the quality, lot separation, sampling, dry milling and bagging. Bokasso is also part of a project by TechnoServe to improve lot separation. They are using traceability sheets to track coffees from days of production at drying tables all the way to the warehouse. The washing station is in an area with great growing conditions and this is translated into an excellent cup. We thought this coffee was quite a killer espresso from last year’s harvest and this year’s crops did not disappoint too. Floral and fruit tea-like aromas followed by citrus, red berries and lavender notes. This coffee is creamy and sweet with a lingering finish that makes it quite a memorable cup. Processing: Pulped and wet fermented, graded in washing channels, soaked in water and sundried. Drying: Sun dried 10 – 15 days on African drying beds on hessian cloths. Coffees are covered in plastic during midday and at night. This month has been frantic as we roll out another new fresh crop from the Centrals to complement our range of single origin espresso. Introducing Finca San José, from El Salvador, not to be confused with the farm with the same name that we had last year from the Mierisch family in Nicaragua. We had the opportunity to cup this coffee with our friends from Viva Espresso in their cupping lab in San Salvador and it easily went into our shortlist. This farm is located in Sonsonate (Western El Salvador) with altitude ranging from 1379 to 1645m asl. We actually travelled through this town back in 2011 when we took some time off work, so it stuck to us fairly easily when we started to find out more about this farm. Rummaging the history books, Finca San José was purchased by Mr Rodolfo Ruffatti in 1934. The farm is currently owned by the great-grandchildren, Mr Mauricio Ruffatti and his sisters, Adela and Fiorella. The farm produces mainly Red Bourbon, and also Pacas and Pacamara. Many of the Bourbon trees in the original plantation are still productive at almost 80 years old of age. The coffee is processed at Beneficio Tuxpal, which is managed by our friend, Federico Pacas. When we visited Beneficio Tuxpal, we were impressed by the operations of the wet and dry mill. Federico and his team have put in a lot of effort to produce and process high quality coffees. We are very honoured to have the opportunity to work with Federico and this coffee is one of the two we have bought from Cafe Tuxpal. 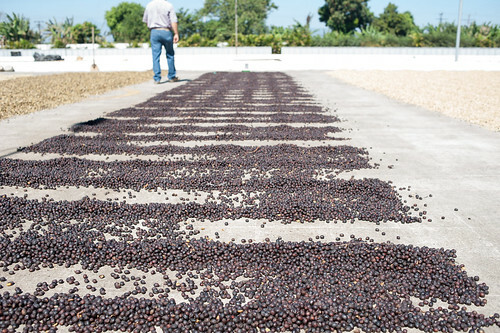 This particular lot from Finca San José is a fully washed coffee. It is super clean and sweet with notes of dark cherries and sultanas. One would love the creamy mouthfeel of the espresso and for milk-based coffee drinkers, you might find yourself drinking a hot cup of chocolate sundae!